Before Pandora…. Before YouTube…. Before Spotify….. how did people experience recorded music? You’ve almost certainly heard music on CDs and perhaps also on vinyl LPs; but how did your grandparents or great-grandparents listen to music at home? Martin Marks (Music and Theater Arts), Forrest Larson (Lewis Music Library), and possibly some surprise guests, invite you to take a ride in our Audio Way-Back Machine. We will experience some historical audio playback technology first-hand. Groove to the sound of our Edison wax cylinder player! Hear “His Master’s Voice” as it sounded on 78 rpm discs of bygone times! And more! 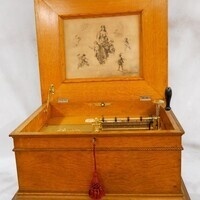 This event will mark the MIT debut of the newest addition to our collection: the magical-sounding Regina music box. Join us in exploring the ways playback technology shaped the listening experience through the 20th century.